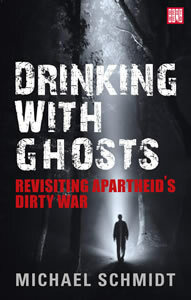 Drinking with Ghosts: Revisiting Apartheid’s Dirty War is a fascinating exploration of the dark corners of South Africa’s past by a veteran journalist. Michael Schmidt’s revelations move from South Africa’s nuclear programme under apartheid to the problems of today’s deeply unequal society, tracing the threads of secrecy, privilege and the violence that is needed to maintain it. The book is also a testament to Schmidt’s career as a journalist: his dedicated and uncompromising quest to uncover the truth of what he finds shines through on every page. Drinking with Ghosts illuminates both past and present and is an invaluable contribution to understanding what South Africa is today. It is also written with verve and passion and is an unputdownable read. Now this is real journalism. Informative, authoritative, properly contextualised, exceptionally well written. Schmidt is a great storyteller with a keen eye for detail. The best 'reporter's notebook' I've ever read. Michael Schmidt is an investigative journalist, anarchist militant, free press activist and published historian. Born in 1966 in Johannesburg and raised by a middle-class white family during the onset of the armed struggle and the Bush War in Southern Africa, he was drafted into the apartheid Army and served more than two years during the Insurrection. The experience – which included his accidental discovery in 1985 that the world’s last white supremacist state possessed nuclear weapons – radicalised him and he later became a conscientious objector, being forced to face a military tribunal in Pretoria in 1991 chaired by a Supreme Court judge, for refusing to serve further. Over subsequent decades, his journalism and his activism took him “behind the curtain” of the transition in South Africa from autocracy to democracy, exploring the impact of the Cold War’s end on sub-Saharan Africa, including the continent’s war-zones, from Lesotho and Mozambique to the former Zaire and Darfur. His path lead him to challenge the dominant liberal / progressive narrative of a “peaceful transition” in the region and to substitute for that a narrative of an often-bloody, hotly-contested continuity in which Nelson Mandela’s ANC fulfilled the long-term strategic neoliberal objectives of their old apartheid enemies, and in which democratic South Africa, the world’s most unequal society, plays a sub-imperialist continental role. He is the co-author, with Prof Lucien van der Walt, of Black Flame: the Revolutionary Class Politics of Anarchism and Syndicalism (USA, 2009), and the author of Cartography of Revolutionary Anarchism (USA, 2013). The founder of the Professional Journalists’ Association of South Africa, and of The Ulu Club for Southern African Conflict Journalists, he today directs the Institute for the Advancement of Journalism, is working on an international multimedia project on massacre and memory with Lebanese writer Rasha Salti, and continues to write for the mainstream and alternative press. Chapter 8: Neighbourhood bully. . . or Bravo? Coda: The daylight or the ghosts?